Five months after he apologized for calling different Republican politicians “moron” and "mental midget,” a public school superintendent in the Grand Rapids area posted on Facebook that politicians are "not intelligent enough to write a coherent bill on their own." 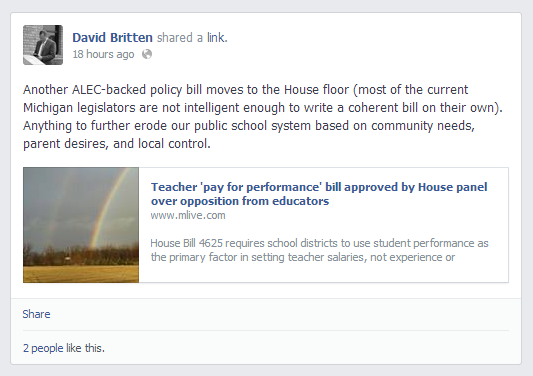 Britten posted the most recent comments on Facebook with a link to an MLive story about a bill that requires public school districts use student performance as the primary factor when determining teacher salaries. "Another ALEC-backed policy bill moves to the House floor (most of the current Michigan legislators are not intelligent enough to write a coherent bill on their own)," Britten posted on Facebook. "Anything to further erode our public school system based on community needs, parent desires and local control." ALEC is the American Legislative Exchange Council, which describes itself as a nonpartisan membership organization of state legislators that favors federalism and conservative public policy solutions. Britten and Godfrey-Lee School School Board President Dennis Groendyke didn’t respond to requests for comment. "It is unfortunate that, of all people, a professional educator would think name calling and spreading misinformation is the best way to resolve something rather than promoting a thoughtful discussion of the facts on an issue," said Ari Adler, spokesman for the House Republicans. In December, Britten apologized for his posts about Rep. Lyon and Agema. "I'm in a position as superintendent not only to demonstrate for our students how to effectively use the advocacy tools available in our political system, but to do so by focusing on the point of disagreement without resorting to name-calling and personal conflict. While I realize that many these past weeks have resorted to a lower level of debate, it does not excuse my inappropriate use of social media and disrespectful comments regarding Representatives Lyons and Agema." Britten's most recent comments on Facebook appeared to be made inaccessible as of May 26.